Mark's Brindle Bugger was developed by Mark Middleton a number of years ago. He had a pensive interest in watching a variety of fish take various types of insects such as dragonflies, damselflies, leeches and bait fish. 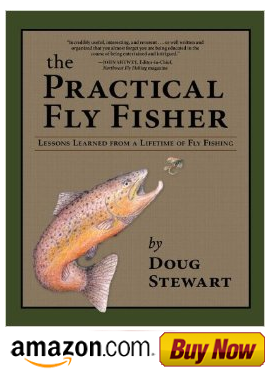 This habit eventually led him into fly fishing and tying flies that simulated the size, shape and color of these underwater denizens. This study eventually led to the development of Mark's Brindle Bugger. It’s size, body color, shape and undulating motion make it alluring to many different types of fish. Step 1.Tie in a small bunch of marabou and Krystal Flash, length not to exceed 1 to 1 and1/2 inches. Step 2. Attach the hackle and chenille. Next, wrap the thread forward to 3/16-inch of the eye. Step 3. 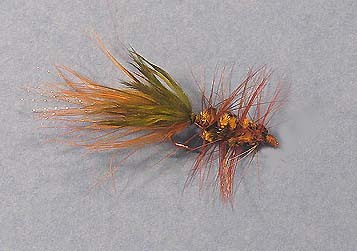 Spiral the chenille forward and follow with 4 to 5 turns of hackle. Step 4. Tie off the head and cement.